How can I edit how a donation is displayed? Step 2: Open the Fundraising tab and click on "Donations"
From the "Fundraising Tab" of your Admin Dashboard click the "Donations" link from the left hand navigation under your organization's logo. From the "Donations" page, scroll all the way to right from the names, and click on the "small pencil icon" for the donation you wish to edit. 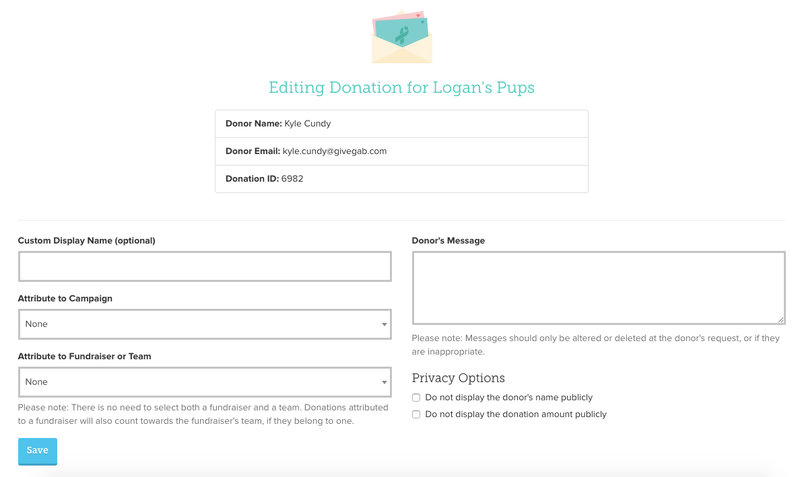 You will now see a page where you can edit the Display Name, the Donor's Message, and add attributes to individual campaigns, fundraisers or teams or make the donation amount or donor anonymous. After you finish editing the donation form, click on the blue "Save" button at the bottom left to save your changes. Your donor's display information will be updated automatically!